How To Monetize YouTube Channel And Start Making Money! You're finally getting views on your YouTube videos but don't know how to monetize YouTube channel yet? This exhaustive guide covers everything from eligibility to approval! Over the years, being a YouTuber has become one of the most exciting self-employed professions to exist today. Simply because there's insane money to be made here. YouTube has an active user base of 1.3 billion users, and about 300 hours of video content goes online each minute! You can well imagine the size of the audience that exists to watch YouTube videos. A platform's viability can be estimated by the measure of the audience. YouTube is also one of the most visited sites on the internet right now. All of these things make YouTube partner program a great option for you to consider. So, if you're ready to enable YouTube channel for monetization, let's follow the procedure step by step. Before jumping onto the action, you will need a YouTube account. It's pretty easy to sign up with Youtube. You only need a verified Google Account. The answer to How to monetize YouTube channel begins with a Google Account. If you're already using Gmail, you can use the same email address and password for logging in to YouTube. Once logged in, you're all set to upload your first video. 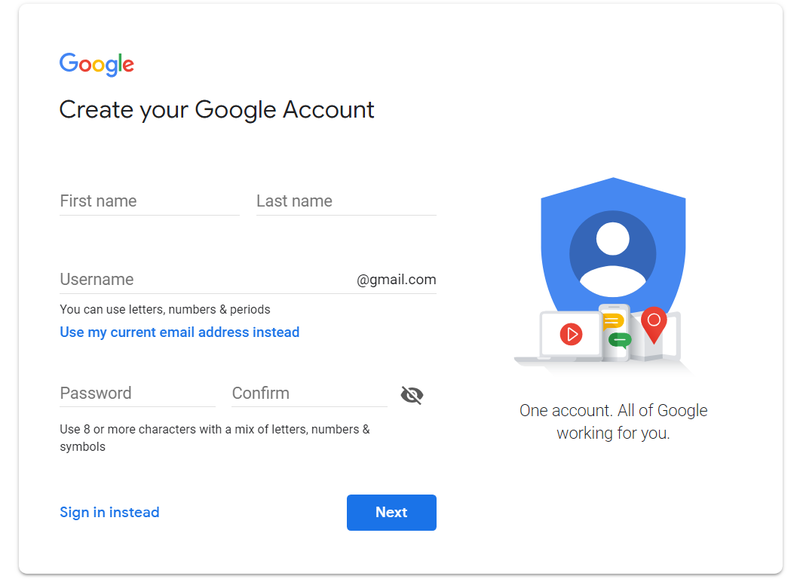 Go to Google Account Sign up page and enter your details. Follow the steps to verify the account. Log in to www.youtube.com with your new Google account credentials. Check out the Studio section and edit your channel name accordingly. Before we directly jump on to how to monetize YouTube channel, let's learn some basic rules. 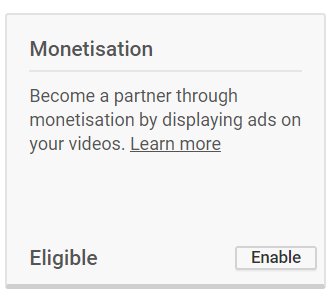 The most recent update made to the YouTube partner program is the eligibility criteria. You need at least 4000 hours of watch time and 1000 subscribers in order to enroll for the program. Both these terms must be met inside the past 12 months of your application. 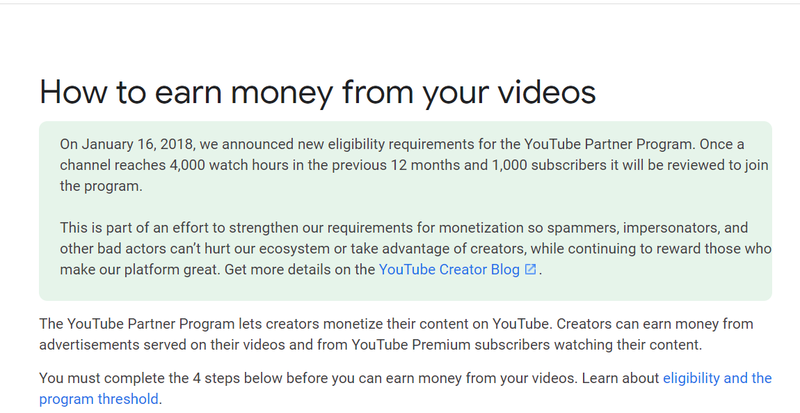 Note - If you already have a YouTube account which has been monetized, the same criteria would apply to it. YouTube is cracking down on spammers and videos that promote illegitimate content. Therefore, if your channel publishes videos that fall in the following categories, you might not be able to earn money. Once you start earning, all your revenue will reflect in your AdSense account. Hence, you will need to sign up for AdSense as well to earn money from YouTube. This is quite simple. All you have to do is to go to Adsense Sign Up Page and fill in your details. AdSense controls what kind of Ads would appear on your YouTube channel. If you're wondering how to monetize YouTube channel with AdSense, then you should know that both these things are owned by Google. Hence, AdSense is just a way to control the Ads. How to Enable YouTube Channel for Monetization? You've just completed half of the YouTube monetization requirements so far. Now, you have to join the YouTube partner program to monetize your content. Let's see how to do it. 2. Go to YouTube Studio option from the menu in the top right corner. 3. Once you're in the Creator Studio, under the tab that says "Channel"
4. Click on the tab that says, "Status and Features"
5. You will find the monetization option in here. Click Enable YouTube Channel for Monetization. 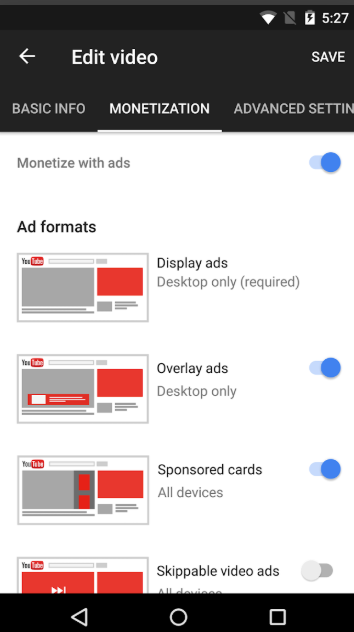 Wondering where is the monetization tab on YouTube? It's the second tab in the first row in the Status and Features Dashboard. After completing these steps, you'd be prompted to accept the terms and conditions of the YouTube Partner Program. Read the conditions carefully and move ahead with your application. Your application will then be reviewed by YouTube staff before you can start earning money. By now we have answered that how to monetize YouTube channel. You know the steps, the guidelines and how to submit the application. But after you get the approval, you need to be careful of the YouTube Partner Program (YPP) terms as well. The terms are fairly simple and tell you what's possible and what's not. Here are the all the important terms you must keep in mind. Your video content shouldn't have anything that violates content guidelines. It usually involves the things we mentioned in YouTube Prohibited Content earlier. Even the thumbnail, the description, the tags and any external links that you put up must not contain anything that's unlawful. Most of your video content should be original. If you intend to use anything that is not directly yours, you must obtain license or permission to do so. By chance, if an external creator complains of copyright issues on your page, your channel may get suspended. If you're using third party content, you must add something of value to it. For example, if you're talking about a recent news bit or anything else already published. You must add significant value to it. If someone finds that you're using their content without prior permission, they can claim their content via a copyright strike. Learn more about Copyrights on YouTube here. You must not click on the ads that appear on your videos. Nor should you solicit clicks from other users in any case. You can request your viewers to like your videos or to subscribe to your channel but you can't ask them to click on ads in any way. Similarly, using a third-party tool or service to solicit views on a video is also wrong. How to Monetize YouTube Channel on Mobile? If you're more of a mobile person, you can do the same on your phone as well. 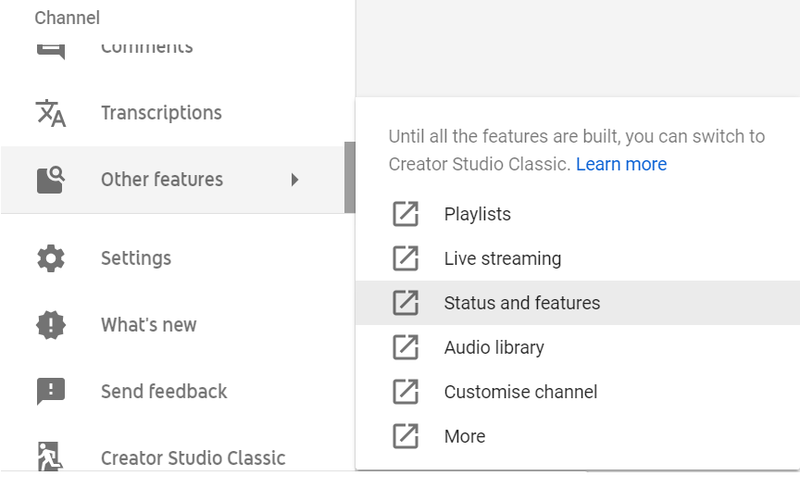 For this, you'll need an additional app for your YouTube channel - the YouTube Studio App. Using this app, you can access most of the YouTube channel features. You can upload new videos, manage views, access analytics and control ads on your channel. If you don't like opening your PC much, this app will do the needful for your. You can even reply to comments and keep a track on new subscribers. The app serves as the best on-the-go alternative for someone who just wants to look at the channel's status. The best part is that you get instant notifications for everything on the channel. This was not possible with the PC version of the YouTube earlier. You can also access Creator Academy videos on the mobile phone using the app. What if my watch hours don't cross the threshold of 4000 hours in near future? This is a very reasonable doubt. In case your channel got approval for monetization and somehow in successive months, your watch hours dropped below the threshold, what will happen. YouTube says that in such a case, nothing will happen. Your eligibility status will hold true and you can continue to monetize your videos. Unless a new policy comes up that makes it necessary to achieve more than 4000 hours, things will be different. How do I withdraw balance from my AdSense Account? You can set up a withdrawal mode in the payments section of Adsense. Google allows various payment options such as checks, wire transfer, and Western Union Quick Cash. According to the availability in your country, you can choose a befitting option. For steps on setting up your payment mode, follow this AdSense Guide. Is there a specific criterion for getting approval? YouTube partner program approval totally depends upon your threshold eligibility and the discretion of the reviewer. There is no hidden mechanism that can get you approval sooner. Make sure that your channel is genuine and you follow the community guidelines properly. How much money can I earn via the YouTube Partner Program? Almost every YouTuber earns a different sum which depends upon their user engagement. The YouTube fees are determined upon a number of factors. These factors are; Ad clicks, the number of views, watch hours, ad impressions, the number of ads in a video, YouTube premium content and many more. Depending on how your video performs with the viewers, your fees are calculated. Can I control what Ads my viewers get to see? Yes. You can control the type of ads your viewers get from your Adsense dashboard. All of these ads come in various shapes and sizes. You can choose how these ads appear on your YouTube video. You can even control if all your videos should be monetized or only a few. Adding too many ads can ruin the experience of the users and too fewer ads may hinder earnings. Hence, you have to strike a balance between the two. By now you know How To Monetize YouTube Channel and start making money from it. You can read most of the things that you must take care of at the time of enrollment. But still, there are a number of things that you will figure out as you become a creator. YouTube is undoubtedly a great platform for unfurling your creativity, and it helps in making a substantial income too. James writes SEO/SMO articles for businesses that want to see their Google search rankings surge His articles have appeared in a number of Websites. He contributes articles about SEO/SMO techniques regularly. This entry was posted in YouTube. Bookmark the permalink. Unique Instagram Username Ideas To Set Your Account Apart! How To Download Instagram Live Videos on PC and Phone!